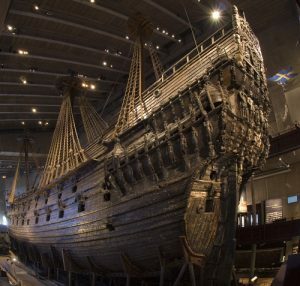 The EDOC 2018 conference dinner will take place at the legendary and beautiful Vasa museum (https://www.vasamuseet.se/en). Vasa (or Wasa) is a Swedish warship built between 1626 and 1628. The ship foundered after sailing about 1,300 m (1,400 yd) into its maiden voyage on 10 August 1628. It fell into obscurity after most of her valuable bronze cannon were salvaged in the 17th century until she was located again in the late 1950s in a busy shipping lane just outside the Stockholm harbor. 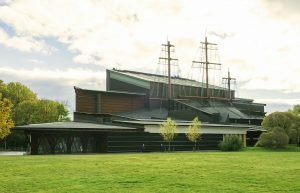 Salvaged with a largely intact hull in 1961, it was housed in a temporary museum called Wasavarvet (‘The Wasa Shipyard’) until 1988 and then moved permanently to the Vasa Museum in Stockholm. The ship is one of Sweden’s most popular tourist attractions and has been seen by over 35 million visitors since 1961. Since her recovery, Vasa has become a widely recognised symbol of the Swedish ‘great power period’ and is today a de facto standard in the media and among Swedes for evaluating the historical importance of shipwrecks. The ship was built on the orders of the King of Sweden Gustavus Adolphus as part of the military expansion he initiated in a war with Poland-Lithuania (1621–1629). It was constructed at the navy yard in Stockholm under a contract with private entrepreneurs in 1626–1627 and armed primarily with bronze cannon cast in Stockholm specifically for the ship. Richly decorated as a symbol of the king’s ambitions for Sweden and himself, upon completion she was one of the most powerfully armed vessels in the world. However, Vasa was dangerously unstable and top-heavy with too much weight in the upper structure of the hull. Despite this lack of stability she was ordered to sea and foundered only a few minutes after encountering a wind stronger than a breeze.